May I download the bokeh light textures? This is really pretty. You depicted both of the Enchanted protagonists really nicely - wonderful likenesses. The lighting here adds such a lovely warmth to the piece too. This is a gorgeous artwork. Enchanting! I love the colors! Lovely! The glow is pretty! Love this! Love the movie! I'm amazed by the detail of this - I noticed you got her hand the way she had her fingers perfectly. Great work! Gorgeous. New Wallpaper. Love it. I hope, it's a good movie, I'm downloading it now because of this picture! I love this film, thank you for this magical painting ! Have you already painted "pip", the lovely squirrel of this film ? you don't know how much i love this movie. great work, as always! Hey! I was wondering if I could share your art in one of my journals. I will give you full credit, of course. I'm mesmerized by the coloring! I love how simple yet complex this piece is. Absolutely amazing! Beautiful! You're an amazing artist! My favorite scene, too. You've captured it beautifully, while also adding to it your own touch and influence. Ah! I've seen so much of your gallery I have no idea what I commented on or not but I just had to say this is lovely! I loved that movie and this is just as magical as that scene was! I have no idea how you do it, but your rough strokes and lighting always combine perfectly! Hey hey hey! Just letting you know that I loved this very much, placed it on my blog (facebook.com/MemoriesAreImmortal). I never thought Patrick Dempsey was all that and a bag of chips like so many others out there, but even in this movie I had to have my "Awwwww cute!" moment. 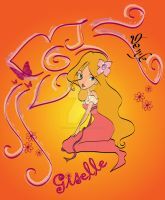 It's Giselle! At first I got this confused with Ella Enchanted, but I haven't seen either movie in a while. Well, a girl can dream, nope? D'awww. So cuuute~! This is a lovely scene. Do you have a tumblr??? look at this print while listening to "Little Wonders", you will be amazed!!!! !